Incineroar is a Fire/Dark-type Pokémon that debuted in Pokémon Sun and Pokémon Moon. It is the final evolution of Litten, evolving from Torracat at level 34. In the English version of Super Smash Bros. Ultimate, Incineroar is voiced by H.D. Quinn, who has done voiceovers for the Pokémon Sun and Moon anime. 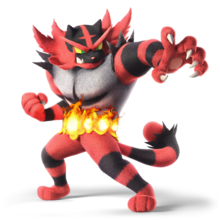 Incineroar appears as an unlockable playable fighter in Super Smash Bros. Ultimate. Its debut trailer was paired with Ken Masters' trailer, where the two briefly fight on the Boxing Ring stage. Prior to openly revealing itself, it also briefly wore a white hoodie when attacking Ken. Incineroar is unique in that it poses after performing a special move, though this pose can be canceled at any point and thus does not affect the fight. Gaogaen From 「ガオー」 (gaō), an onomatopoeia for roaring, and 「火炎」 (kaen), meaning "flame"
Chìyànpáoxiāohǔ Literally "Blazing-Flame Roaring Tiger"
This page was last edited on April 14, 2019, at 22:35.